All the earths are burnt metals. 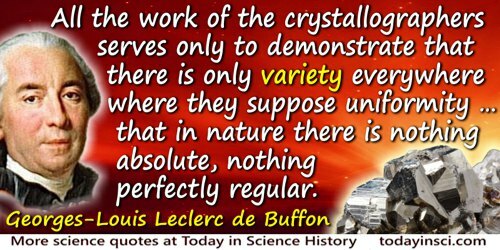 All the work of the crystallographers serves only to demonstrate that there is only variety everywhere where they suppose uniformity … that in nature there is nothing absolute, nothing perfectly regular. In Histoire Naturelle des Minéraux (1783-88), Vol. 3, 433. Conservation is the foresighted utilization, preservation. And/or renewal of forest, waters, lands and minerals, for the greatest good of the greatest number for the longest time. Fertile soil, level plains, easy passage across the mountains, coal, iron, and other metals imbedded in the rocks, and a stimulating climate, all shower their blessings upon man. The Red Man's Continent: A Chronicle of Aboriginal America (1919), 87. Fossils are of four kinds, viz. saline, earthy, inflammable and metallic; hence arise four classes. In Outlines of Mineralogy (1783), trans. William Withering, 12. [Before it was used for the petrified remains of organic forms, the word “fossil”—obsolete, as used here—refers to that which is “dug from the earth, preserved in the ground.” Hence, in the quote, Bergman is classifying minerals, which are the subject matter of his book. —Webmaster] Also collected in William Withering (the son, ed. ), The Miscellaneous Tracts of the Late William Withering (1822), Vol. 2, 15. I died as animal and I became man. 'I Died as a Mineral', in Arthur John Arberry, Classical Persian Literature (1994), 241. Natural bodies are divided into three kingdomes of nature: viz. the mineral, vegetable, and animal kingdoms. Minerals grow, Plants grow and live, Animals grow, live, and have feeling. 'Observations on the Three Kingdoms of Nature', Nos 14-15. Systema Naturae (1735). As quoted (translated) in Étienne Gilson, From Aristotle to Darwin and Back Again: A Journey in Final Causality (2009), 42-43. One can descend by imperceptible degree from the most perfect creature to the most shapeless matter, from the best-organised animal to the roughest mineral. 'Premier Discours: De la Manière d'Étudier et de Traiter l'Histoire naturelle'. In Oeuvres Complètes (1774-79), Vol. I, 17. RADIUM, n. A mineral that gives off heat and stimulates the organ that a scientist is a fool with. The Collected Works of Ambrose Bierce (1911), Vol. 7, The Devil’s Dictionary, 273. 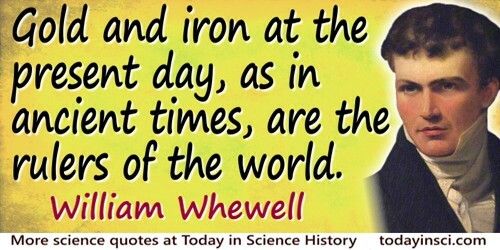 The essence of the simplest mineral phenomenon is as completely unknown to chemists and physicists today as is the essence of intellectual phenomenon to physiologists. The mineral kingdom consists of the fossil substances found in the earth. These are either entirely destitute of organic structure, or, having once possessed it, possess it no longer: such are the petrefactions. In Outlines of Mineralogy (1783), trans. William Withering, 5. [Before it was specifically used for the petrified remains of organic forms, the word “fossil”—obsolete, as used here—refers to that which is “dug from the earth, preserved in the ground.” —Webmaster] Also collected in William Withering (the son, ed. ), The Miscellaneous Tracts of the Late William Withering (1822), Vol. 2, 9. Diseases of Workers, translated by W. C. Wright, preface. The volume now in press will make the new gospel of geology and mineralogy, and if I live to complete my mineralogical text-book, I shall do for the mineral what Darwin did for the organic world. Letter to a friend (1886), as quoted in Paper read before the American Philosophical Society (1 Apr 1898) by James Douglas, printed as A Memoir of Thomas Sterry Hunt (1898), 12. There is no generation from an egg in the Mineral Kingdom. Hence no vascular circulation of the humours as in the remaining Natural Kingdoms. Systema Naturae (1735), trans. M. S. J. Engel-Ledeboer and H. Engel (1964), 20. 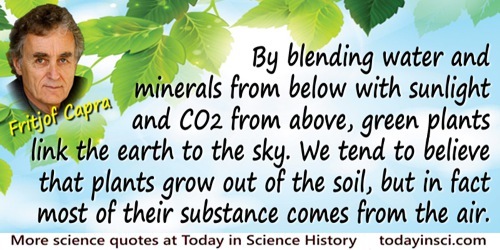 To learn… the ordinary arrangement of the different strata of minerals in the earth, to know from their habitual colocations and proximities, where we find one mineral; whether another, for which we are seeking, may be expected to be in its neighborhood, is useful. In The Writings of Thomas Jefferson (1854), Vol. 7, 443. 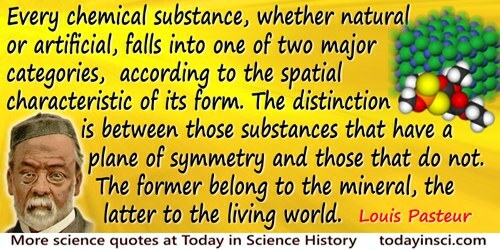 To trace the series of these revolutions, to explain their causes, and thus to connect together all the indications of change that are found in the mineral kingdom, is the proper object of a THEORY OF THE EARTH. Illustrations of the Huttonian Theory of the Earth (1802), 2.